Prosciutto di Parma, Genoa Salami, Hot Sopressata, Capicola, Mortadella, Mozzarella, Provalone, and Fontina Cheese. Roast Beef, Swiss, and Provel Cheese. Your choice of 2 Dry Sausages. Served with Honey Mustard Dip and Crackers for the perfect party tray. 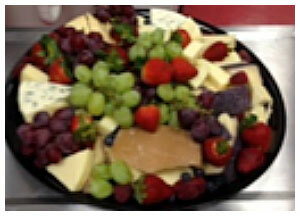 Gorgonzola Wedge, Merlot BellaVitano, Fontinella, and Aged Provolone, with Crackers and Fruit. Pair with your favorite wine. Kalamata Olives, Gigante Olives, Fresh Mozzarella and Tomatoes, Mediterranean Mushrooms, and Sweet Peppadew Peppers. The eye-popping tray is a hit at any party. We start with a loaf of our famous Table Bread sliced in half, and we build a work of art. A traditional Pittsburgh sandwich with Baked Ham, Genoa Salami, Capicola, and Pepperoni layered with Provolone Cheese. 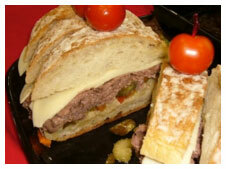 We serve this with Olives and Peppadew Peppers. Hot Capicola and Genoa Salami with St. Louis Provel Cheese. We serve this with Olives and Hot Pepperoncinis. Cheese and Giardiniera, built around a bowl of Italian Au Jus for dipping. R delicious salads are made from scratch and must be preordered.